To begin, bandwidth is the amount of data that can be transmitted in a fixed amount of time. This is measured in Megabit per second (Mb/s). How much bandwidth you need depends on what you plan on doing with the internet connection. For the most part, more is better, constrained of course by your budget. Data is to available bandwidth as water is to the size of the pipe. As the bandwidth increases, so does the amount of data that can flow through in a given amount of time, just like as the diameter of the pipe increases, so does the amount of water that can flow through during a period of time. Regardless of whether you are using a Wired or Wireless connection (or both), the bandwidth allocation will always be set to the pipe you have been allocated to. 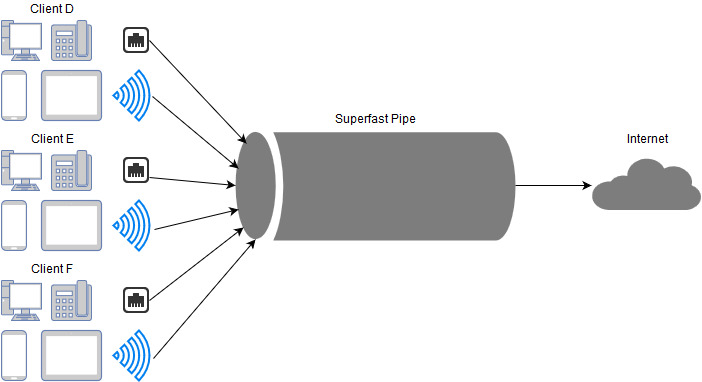 Multiple clients are likely to share the Standard Pipe and the Superfast Pipe at a site and therefore the bandwidth is contended (Contended = Sharing - The more usage on the line, the slower the speeds will be). This means, for example, on the Standard Pipe, if "Client A" is using a high amount of bandwidth, or even over utilising (maxing out) the bandwidth, then this will leave little bandwidth for "Client B" and "Client C". As a result, ALL clients on the pipe will suffer from slow speeds and/or drops in connection. The Dedicated Pipe is more relatively straightforward in comparison to the Standard and Superfast Pipes. If a client is on a Dedicated Pipe, this means they have an allocation of bandwidth to themselves, i.e. no other client can interfere with the usage on this pipe. 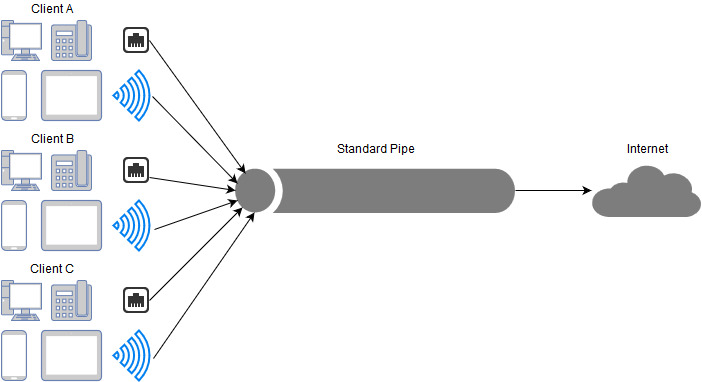 If the client is over utilising the Dedicated Pipe, you will need to check what protocols they are using on Connect. This is under Bandwidth on Connect. How do you know if a pipe is being over utilised? 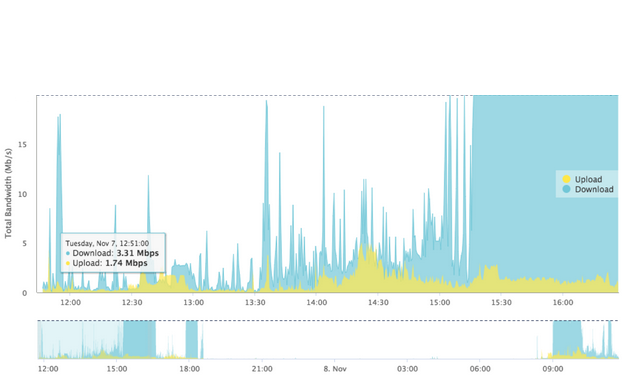 As you can see from the example above, from around 15:15, the bandwidth is completely over utilised. This will result in slow speeds, network drops, network lags, difficulty connecting to Wifi etc. 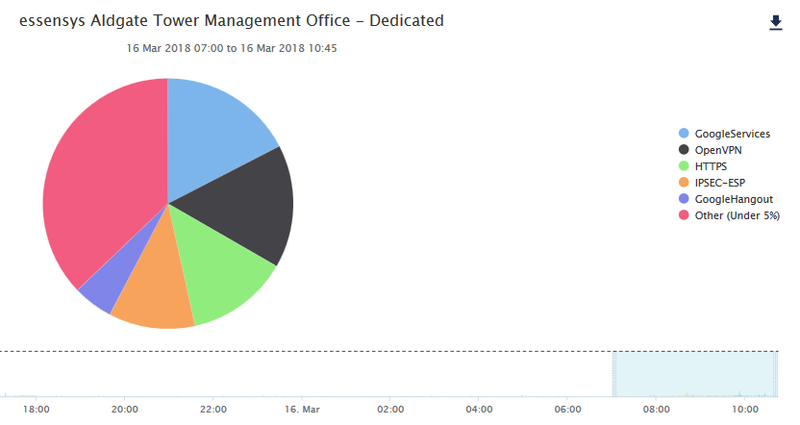 Between 15:00 to 15:15, the bandwidth is being over utilised intermittently, which will cause the same issues as above for those times. What do you do if the pipe is overutilised? As from the example above, you can see a full breakdown of the services used for that time period. 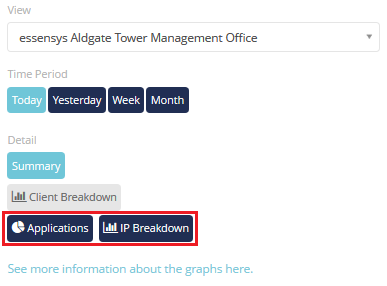 If you are over utilising your Bandwidth and you have a Public IP, you will need to investigate your usage with their IT Team/Provider. This provides information for each user on the network. With the example above, the IP address 172.28.3.25 is using the vast majority of the bandwidth within the time frame selected. If the you are over utilising your bandwidth, you will need to investigate the usage for this user.